University of Chicago Press, 2018. FOR BERGER THESE ANIMALS are not just fascinating puzzles but powerful symbols as well, “relics of the past and fugitives in a modern world.” The Los Angeles-raised wilderness buff tries to understand their relationship with other species, their perceptual worlds, and the interplay of food base, climate, reproduction rates, predation and human incursion that either dooms them or makes them thrive. Yankee whalers with breechloaders, in a textbook example, exterminated muskoxen in 19th century Arctic Alaska. In 1930, the animals were replenished with Greenlandic stock shipped thousands of miles. Inupiaq Eskimos no longer familiar with the long-skirted bruisers see them as competition to caribou, an important subsistence game. (Similarly, yak pastoralists on the Tibetan Plateau think wild yaks take food from the mouths of domestic herds.) Some grizzlies learned to breach the bulwarks adult muskoxen form when they feel threatened, slaughtering numerous animals — more than they can eat — and eliminating entire herds. Mortality from bear kills has increased twenty-fold lately. Sealing off plants on which muskoxen feed, frequent winter thaw-and-refreeze episodes have been causing the animals hardship, stunting the calves’ growth. In 2011, a February storm whipping a western Alaska lagoon drowned 52 out of a herd of 55 that Berger was studying. Was this ice surge nature’s business as usual, a statistical fluke, or a harbinger of things to come? Urgency drives Berger’s scientific agenda. He wonders how long it takes extremophile mammals to adapt, and what it takes for them to do so. A muskox mother with her newborn near the DeLong Mountains, Alaska. A herd stands in defense of a downed muskoxen (far right), Bering Land Bridge, Alaska. A biologist approaches a herd of muskoxen in western Alaska. A group of muskoxen in flight, Bering Land Bridge, Alaska. A newborn calf with their mother looking agitated because of the photographer, Berger, at Cape Krusenstern National Monument, Alaska. Drawing on 33 expeditions, the book shows biological fieldwork, warts and all. Berger digs “chip-like” or “slimy nugget” stool samples from muskox anuses with frost-stiffened fingers when he’s not defending projects to belligerent locals. Conservation can be a bloody business, as in sawing horned heads off for postmortems. And before muskox calves could be captured for Depression-era reintroductions to Alaska, all the adults in their fiercely steadfast parental groups had to be killed. An old-school biologist of Jane Goodall or George Schaller’s cut appears in these pages, one sharply in tune with modern ethics. The poetry-quoting Berger feels for the animals, which he regards as sentient individuals, not anonymous research subjects. He worries they’ll burn calories or break bones stampeding. “We would never know the emotional toll of becoming a muskoxen orphan in the Beringian wilds, or that of females we (accidentally) detached from their herds,” he writes. Berger acknowledges PTSD in these creatures and its effects on their physical and emotional wellbeing; he therefore favors non-invasive approaches. “Another day, another datum,” he quips, speaking of a tranquilized animal. He constantly weighs the trade-off between science and conservation. His methods range from the high-tech — radio-collaring; heli-darting; photographic profiles to determine growth rates; hormone analyses to assess stress-levels or pregnancy — to the experimental, as when he plays wolf-howl recordings to caribou or stalks muskoxen in a bear costume, only to be charged. Many mysteries remain. How do thousands of caribou cows give birth within the same 10-day window, overwhelming bear and wolf predators with sheer numbers. And do muskoxen remember their dead? 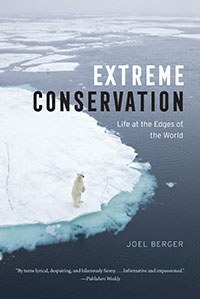 The book’s blunt title holds dual meaning: It references the conditions under which Berger and his assistants labor (whether climatic, physical, logistical or political) and also the measures we need to take to avoid the worst of the sixth mass extinction.